While residential gigabit access has been technically feasible for years, few service providers have included it in their portfolios. It seemed highly unlikely that the customers would be willing to pay for such speeds, let alone actually perceive a change in their Internet use. And even today, some major players still question the demand for gigabit among their customers. Residential gigabit is however gaining traction. In a lot of markets, the demand for gigabit is already there, whether it is widespread or just a niche, and some providers are seizing this opportunity. The better user experience appeals to some customers that are ready to pay a premium for it, and can represent an opportunity for service providers to increase their Average Revenue Per User (ARPU). What’s more, providing residential gigabit can prove to be a powerful marketing tool. A number of questions arise when considering the launch of residential gigabit: what benefits should be expected ? Which characteristics should the gigabit product have (upload speed, data cap…)? How to include it in the service provider’s portfolio (number of plans, speed of entry-level offer…)? At what price should residential gigabit be sold? Should it be discounted or bundled? These are some of the questions we aim to answer with this report. With an analysis based on 75 gigabit offers, their characteristics, and that of the service provider’s portfolio, the report identifies trends and shapes recommendations for service providers. 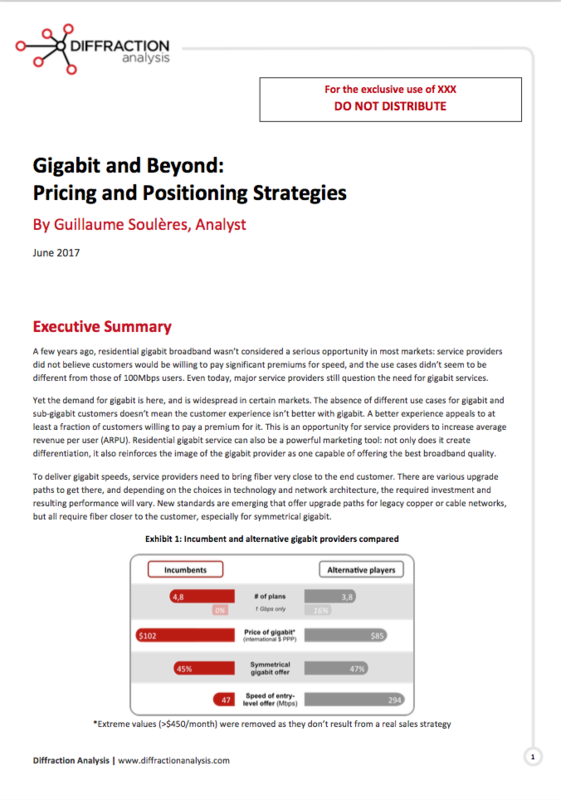 This report is a must read for broadband providers entering the gigabit landscape, as well as for those who want to assess the positioning of an existing gigabit product. The report is available for direct purchase via Paypal (with any authorized credit card) or you can contact us for a more traditional payment method. The executive summary of the report can be downloaded from the following link: 2017 – Gigabit and Beyond -Pricing and Positioning Strategies (ExecSummary).